If you’ve got a home workshop or garage in which you store your modified car, you’ll want some suitable decorations to fill the bare spots. You know, stuff like tyre and other automotive advertising signs, perhaps a few old oil cans, an old clock – and maybe a petrol bowser. Hmmm, now what about that petrol bowser? Sounds good - but then the doubts set in. 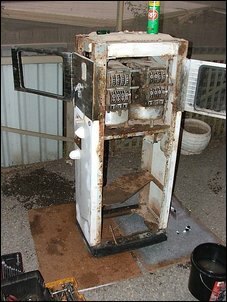 It’d cost a lot to buy - and then cost probably a bloody huge amount to restore. Professional spray painting, new glass, new panels, new lettering on the faceplate. And how hard would it be to get the condition and appearance exactly right – the correct signs, right hoses, period hand-pieces? But there’s an in-between position. 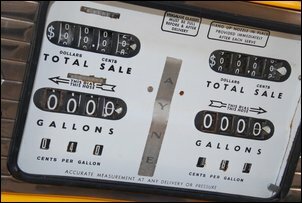 Pick up an old bowser – but not so old that it’s an expensive antique. Then restore the bowser - not to as-new condition, but instead just to ‘presentable’. And that’s just the approach that Adelaide’s Craig Fordham has taken. 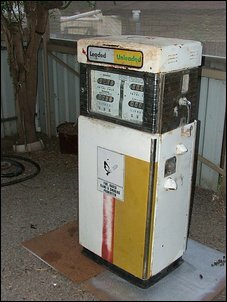 No doubt aficionados of petrol bowsers can find a heap of things wrong with his Wayne 6065 petrol pump. And Craig can find errors too. But the important thing is that he’s now got a great talking point for his home workshop and it’s cost him very little. The first step was to find an old pump. It came about this way. 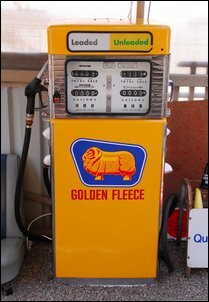 Craig had a mate who’d heard of someone way out in the country whose job was pulling out old petrol pumps. The mate was heading up that way with a trailer, so all Craig had to do was to put in a request – and hand over $200. Luckily, the trailer was equipped with a crane, because the first surprise was how heavy the pump was. 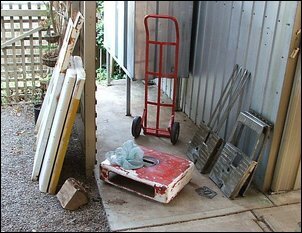 In fact, to get it back to Craig’s place, the bowser had to be stripped – the internal pumps were removed and donated to the mate! The next step was to tear the bowser right down. Using lots of penetrating lubricant to loosen rusty bolts, the innards were removed and the painted panels taken off. The stainless steel trims were also removed. 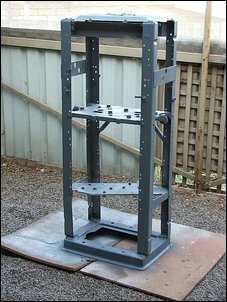 ....and the chassis was wire-brushed and then spray-painted with cans. The trims were polished with an electric drill spinning a buffing pad, using lots of Autosol metal polish. Incidentally, Craig approached professional metal polishers but decided not to take that route when it became clear that polishing to a high lustre could cost a lot of money! 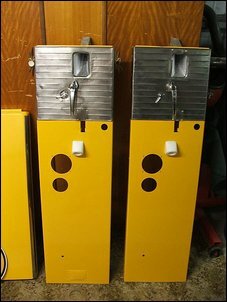 The side panels were sent off to the powder-coaters and came back looking like new. 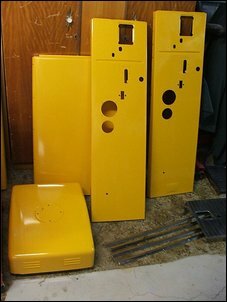 They’d been sandblasted, zinc coated and then powder-coated in ‘emergency yellow’. The polished stainless steel trims were then reacquainted with the side panels, together with some fittings painted white by Craig. 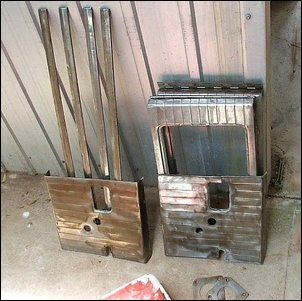 The faceplate is enamelled (like an old-fashioned bath) and it was suggested to Craig that a really strong polish would take off the rust without damaging the faceplate. 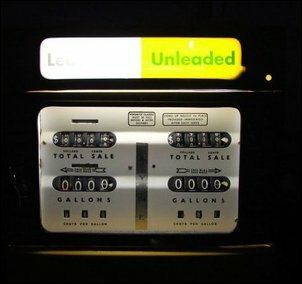 However, Craig liked the character that the minor rust gave the faceplate, and all he did was peel off a sticker that said ‘litres’, revealing the original ‘gallons’ signage. 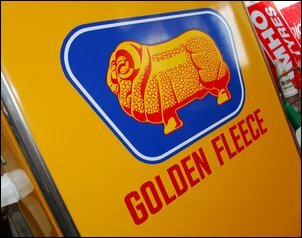 The final steps were to buy a reproduction Golden Fleece sticker, glass and a new trim rubber. 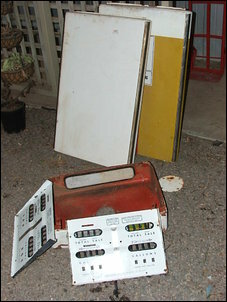 All these parts are readily available from specialists – Craig used Bab’s Bowsers. And here’s the finished result. The handpiece and hose are from a later model pump (that is, they’re not original) and Craig has fitted-up just one side of the pump. 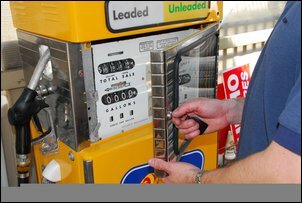 The leaded/unleaded sign is also not period – but as we said at the beginning, that’s fine! The faceplate is a beauty – and of course you can make petrol cost whatever you want per gallon! Craig even has a key to allow the glass to be opened. The lower section of the pump also opens, so if you wanted to, you could install shelves in here – or even a small bar fridge! Craig has even wired the original internal fluorescent tubes to a normal plug, allowing the bowser to glow at night. We reckon the bowser looks great – and if you think so too, keep an eye out for discarded petrol pumps!